Recently, a new patron asked me: What kinds of questions do you get at the Traverse Area District Library reference desk? Sure, we get the usual readers advisory questions, and lots of questions on how to access our digital resources, and occasionally we get asked for advice on where to get dinner. But what really brings in the questions? When construction is happening. It doesn’t matter if we’re talking new construction, rehabilitation, or road repairs. There is nothing that piques our patrons’ curiosity than watching something get built. So, what’s happening in Traverse City that the people are curious about? The revamp of the Murchie Bridge over the Boardman River on West Grand Traverse Bay has brought in the most interest, so let’s dive into a few of the most common questions! Robert Burns Murchie was a Traverse City native, born on October 25, 1894. He was the son of Mary Krouse (d. 1909) and James Murchie (d. 1936). He was a graduate of Traverse City High School, class of 1912, and he earned his law degree from the University of Michigan in 1917. 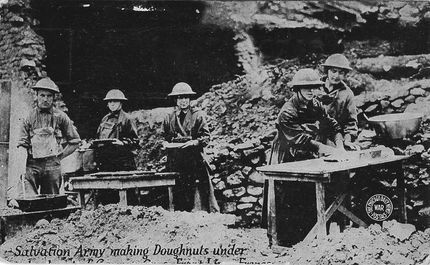 He served during World War I, and spent nine months in France, and upon his return, married Lulu A. Cole of Detroit. After practicing law from 1919 to 1934 in Detroit, Murchie moved back to Traverse City, where he was a senior member of the law firm of Murchie, Calcutt and Son- dee. Why does he get his own bridge? Did he pay for it? Although Murchie probably ponied up a few of his own dollars, he earned that bridge through his civic engagement. Among his many endeavors, he served as chairman of the Traverse City Chamber of Commerce Shorefront Committee, responsible for the location and construction of Grandview Parkway. In 1941, Murchie told the story of how he decided that Traverse City needed the Parkway, in an article published in the Traverse City Record-Eagle. As a child, Lil’ Bobby wished to get to the beach on Grand Traverse Bay (newly reclaimed from industrial waste, thanks to the efforts of Con Foster and the community), but to do so, he had to pick his way across the Pennsylvania Railroad track. The track was littered with sharp little cinders, left behind by the trains. When Murchie returned to Traverse City in 1934, he was struck anew by the beauty of the bay. Recalling his tender young feet so abused, he vowed that the railroad track would no longer plague beachgoers. After several years of work, plans were drawn for the Grandview Parkway, to the tune of $250,000. So that’s it? He served on ONE committee? Big deal. I didn’t know Murchie myself, so I will need to rely on his obituary to answer this one. Murchie was much more involved in Traverse City than just the Shorefront Committee. He served as president of the Traverse City Chamber of Commerce in 1938, Traverse City Rotary Club in 1939-40, and Grand Traverse – Leelanau – Antrim Bar Association in 1961. 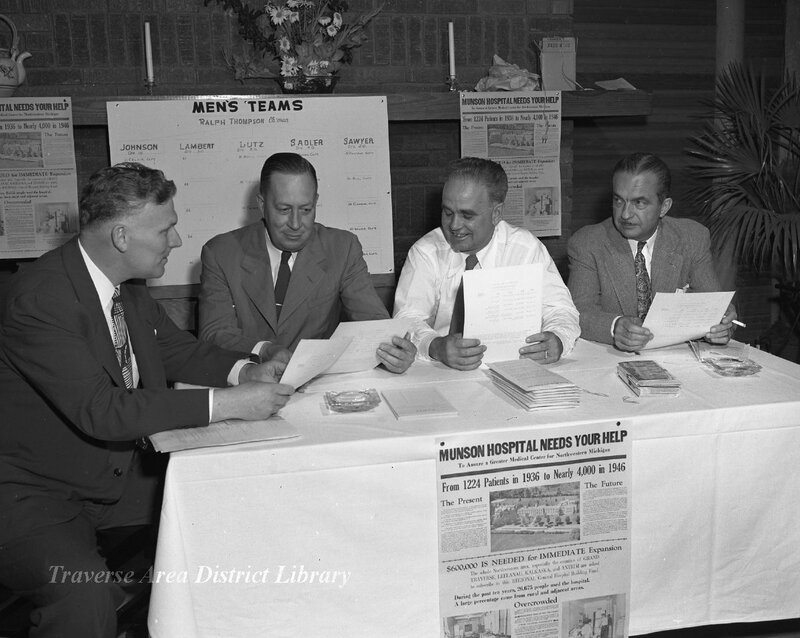 Hospital Drive at Traverse City Country Club, August 6, 1946. Men seated compromise the campaign Executive Committee. L to R: Ralph Thompson, H.W. Heidbreder, Matthew MacIntosh, Robert B. Murchie. Image courtesy of Traverse Area District Library. 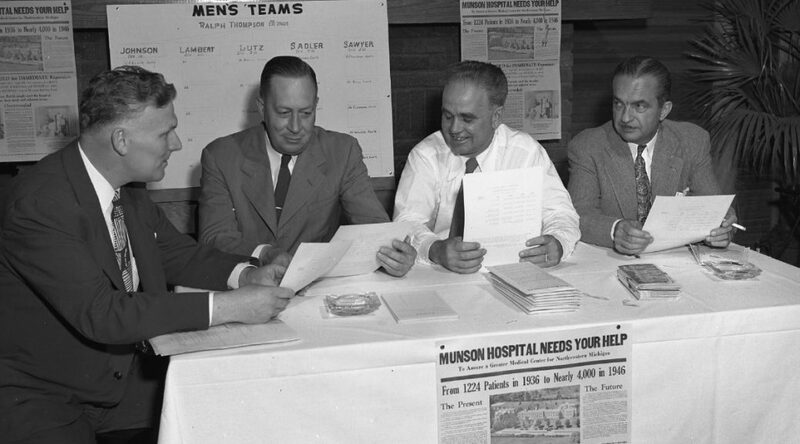 He was co-chairman of a three-man committee responsible for the success of the original campaign for funds with which Munson Medical Center was organized and constructed independently of Traverse City State Hospital; and was chairman of the committees organized to promote the establishment of an Air Force jet base in this area. He was a member of the board of directors of Traverse City State Bank for 22 years prior to retirement in 1964; a member of the American Legion: Veterans of Foreign Wars and a former judge advocate of the state department; a member of the American Bar Association, Grand Traverse – Leelanau- Antrim Bar Association; a life member of Traverse City Lodge 222, FAM; A member of Scottish Rite of Free Masonry Moslem Temple, Detroit; Traverse City Shrine Club; Traverse City Golf and Country Club; Traverse City Elks Club; and a charter member of the Knife and Fork Club. 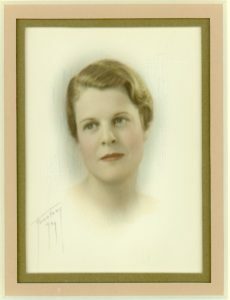 Murchie was the recipient of Traverse City’s Distinguished Service Award in 194B. Hm, pretty busy guy! I guess he can have a bridge named after him. Not that we were looking to change the name, but we appreciate your support. So, here’s to Robert Burns Murchie, and his tender feet. May we all travel a little safer (and with better scenery), thanks to his work! Care to learn more about the beautification of the Grand Traverse Bay waterfront? Check out Richard Fidler’s books, Glimpses of Grand Traverse Past: Reflections on a Local History, and Traverse City, Michigan, 1850-2013. Both of these titles are available for checkout at Traverse Area District Library. Summer Tour(ist) Season is Near! A couple of our area historical societies are offering tours this summer, and here’s the inside scoop! 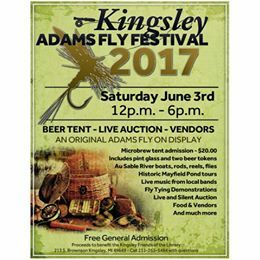 The annual Adams Fly Festival at Kingsley Branch Library promises to be a hoot, as usual! Two tours to Mayfield Pond Park are highlights of this annual event. Come learn about the history of the Adams Fly, its creator Len Halladay, and about Mayfield, a “little piece of paradise” in southern Grand Traverse County. See you out there on June 3rd! 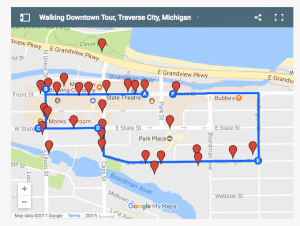 From the Traverse Area Historical Society, they will be bringing back their now-famous Oakwood Cemetery Tours, as well as tours of Downtown Traverse City, and (with perhaps a little help from our readers), possibly a tour of the Sixth Street Historic District. 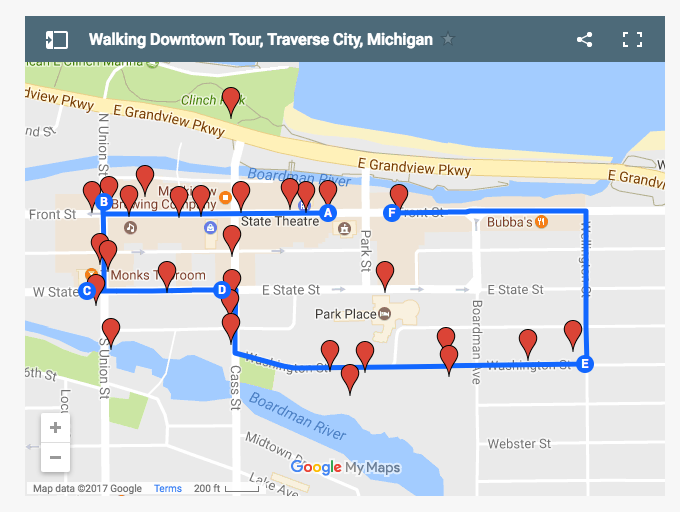 Stay tuned for dates, and in the meantime, enjoy a “virtual walking tour” of Downtown Traverse City by our own Richard Fidler, courtesy of the Society. “Consider getting away from the beach and experience an historical bus tour of Benzie County with knowledgeable local guides. The tours last approximately 2 hours and are available every Thursday and Friday from June 2 through September 1. Plan to visit the Benzie Area Historical Museum too– either before or after your tour! ​There are two tours, each departing from the Benzie Area Historical Museum. One tour travels to Beulah, Legacy Art Park, Thompsonville, Benzonia Cemetery and the other explores the Elberta and Frankfort areas. Tickets are $15 per person; children eight and younger are free. For more information about tour content, contact the BAHS museum 231 882-5538 or info@benziemuseum.org. Milk snakes do not milk cows, contrary to legend. They do hang around barns and other structures–sometimes houses. Someone I know shares her dwelling with occasional milk snake intruders which apparently enjoy living in the crevices of the foundation. It does little good to let her know that they are only looking for rodents and other small varmints—she does not like them. To her credit, they have become only an occasional nuisance, and are only evicted from the premises rather than summarily decapitated, a common response of humans. Image courtesy of the Virginia Herpetological Society. I saw one quite recently, three feet of torpid elegance stretched across a bike path near where I live. Fearing for its life–since it nearly blocked the right-of-way of bicycles–I stamped on the ground to get its attention. With apparent nonchalance, it moved to one side and then into the tall grasses beside the river, its tongue flicking out every few seconds as snakes do. Indeed, why do they do that? Reference books tell me that this is their sense of smell, but that statement is not quite accurate, since the actual organ of smell is inside their mouths. The tongue only samples the air outside. Since they don’t bring air directly past their olfactory membranes, then they can only smell whatever comes to them on the wind, a strange mechanism at least from our point of view, since we can sniff. What smells would they be sensitive to? 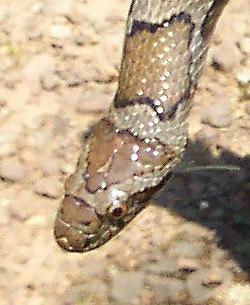 Rodents, one might guess, and other milk snakes, females especially–if a male snake is the prime actor. 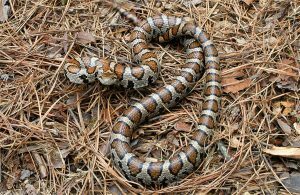 Milk snakes are harmless, but that does not mean they will not attempt to discourage those who would cause it irritation. Like many of its relatives, it will coil, hiss, and strike to incite fear in the hearts of its perceived enemies. It should be forgiven for that behavior, not beheaded. These creatures are most commonly seen in spring and fall. They go after their prey after nightfall, seeking out mice with their flicking tongues, ready to wrap themselves around them in an instant, squeezing them so they cannot breathe. That is what constrictors do. The triangle on the head of this eastern milk snake is very distinct. Image courtesy of the Virginia Herpetological Society. 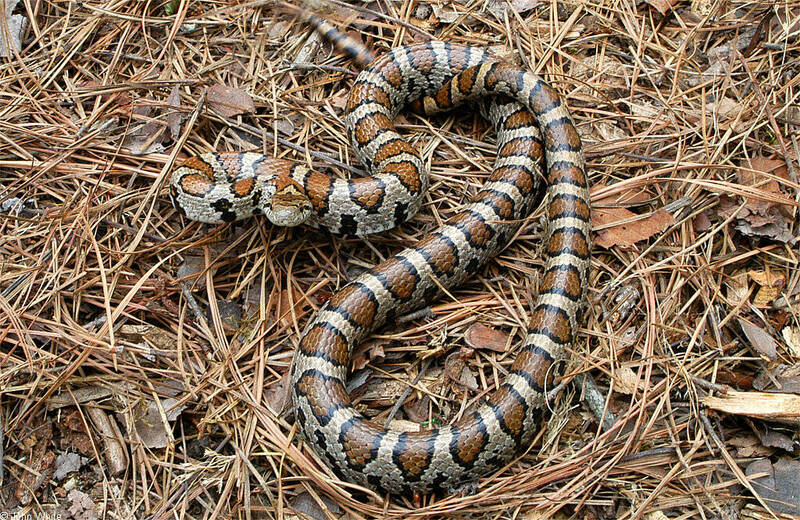 Milk snakes are given the name Lampropeltis triangulum triangulum, the “triangulum” element referring to a triangle or Y-shaped marking at the top of its head. 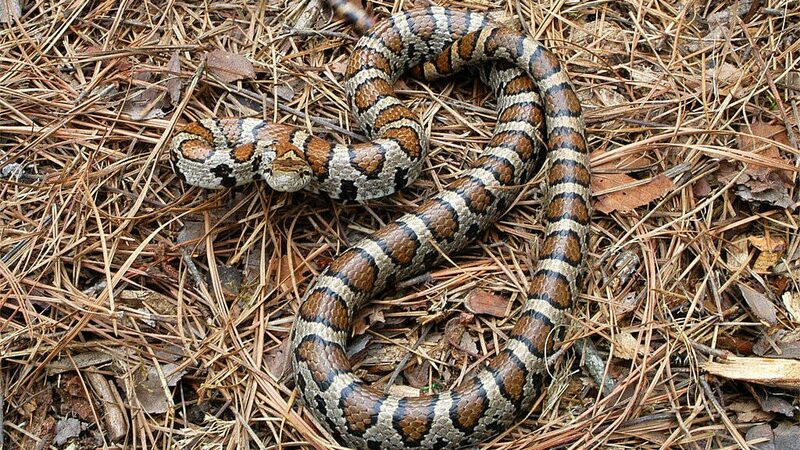 In larger snakes dull red bands decorate its body, but smaller ones will have brighter red stripes bordered with black, all set upon a creamy white background. After your initial surprise at seeing one, you will have to admire this animal for its stunning appearance. As so many snakes and reptiles are disappearing because of habitat disruption, they are to be treasured all the more. Let us live in peace with them. Holman, J. Alan, Harding, James H., Hensley, Marvin M., and Dudderar, Glenn R., Michigan Snakes, Lansing: Michigan State University Press, 1993, 2006. Holman, J. Alan, The Amphibians and Reptiles of Michigan: A Quaternary and Recent Faunal Adventure, Detroit: Wayne State University Press, 2012. Will it be “Close, but No Cigar,” for this month’s mystery? 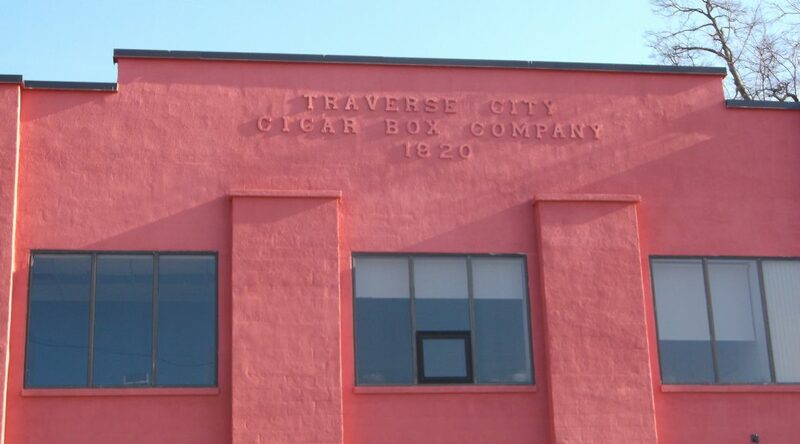 We expect all our readers will get this one, so here’s some extra credit: What do you know about the cigar industry in Traverse City? When did it flourish? How many companies and employees were there? What kinds of people worked for the industry? You might not win a cigar for your answer, but you’ll certainly go down as a legend amongst Grand Traverse Journal readers! Collection available at the Library of Congress, Geography and Map Division, online. Sanborn Maps, if you are a researcher in the fields of architecture, genealogy, or local history, are invaluable tools. Until recently, Traverse Area District Library only held a copy of the 1929 Traverse City Sanborn, a very small slice of the pie. As of May 25th, the Library of Congress has announced the digitization of their collection of maps, some 25,000, all originally published prior to 1900. Maps will be added monthly until 2020, making for a total of 500,000 Sanborns available in their digital collection. As of this publication, the Traverse City maps for 1884, 1890, 1893, and 1899 are all available. 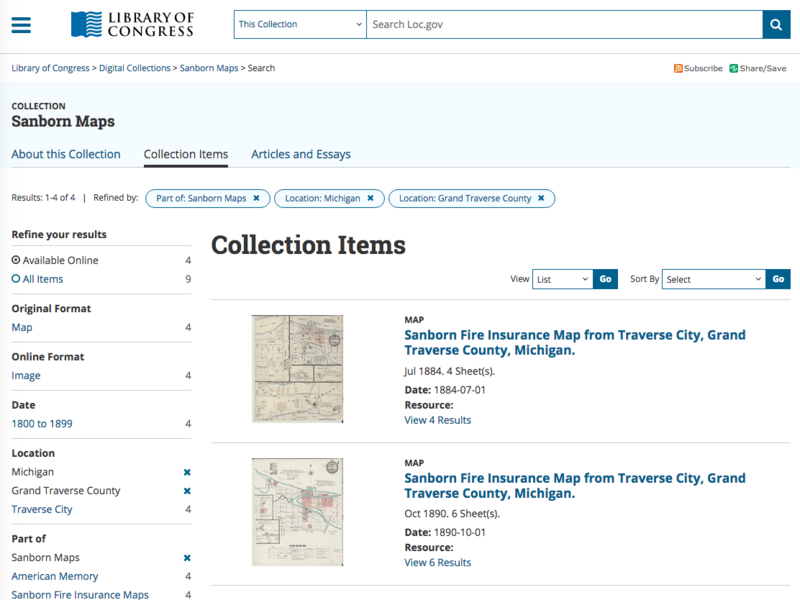 A Sanborn Map was originally used to provide insurance assessment information to insurance underwriters. 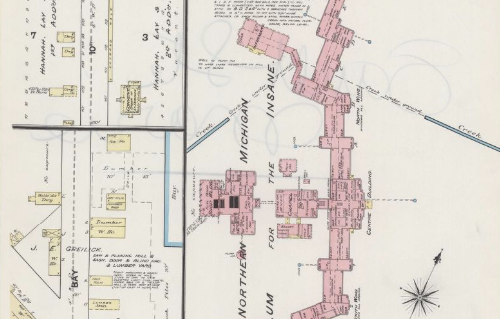 Lets say that you owned a wooden warehouse near the pier in Traverse City in 1890. In it is your whole life’s savings, amounting to $100,000 worth of product to ship out… and that product is quite flammable. You would want to insure it, right? But, there are no local insurance companies, and no insurance agent is traveling to so far a place as Traverse City for several months. So, how can a company assess your property correctly and insure it for the amount you need? 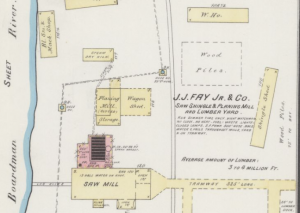 The company would rely on information found in the Sanborn Maps. 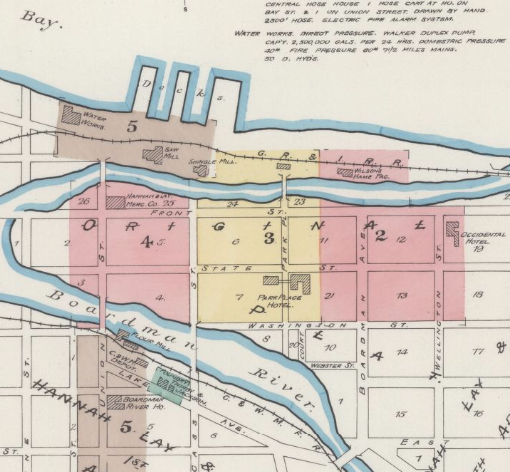 The Sanborn would reveal where your property was within the city, what type of building it was, its composition, and size. They could also look at your neighbors as well. While the Sanborn might not say what is in each building, knowing who your neighbors were (a gas works, other warehouses, residences), would help the insurance agent make a quality guess on what to appraise your property at… and how risky you’re living! How is this information useful for researchers today? Once you know how to read a Sanborn, the world of the past comes alive. Color coding and other indicators found on these maps tells the story of a town. When you boil down all the information, the Sanborn tells you one thing, which can be used for a myriad of uses: How did a city grow, both physically and financially? How does a map answer that type of question? Look to our previous example of 1890s Traverse City. From the Sanborn, we can tell that the city had a significant collection of warehouse buildings near the waterfront, indicating that it was a port city that relied on trade. The large swaths of the city colored in red indicates the predominance of brick-built structures, indicating a lot of sustained growth in the area. How fun would it be to compare the same area, year after year, through the Sanborns? Get the whole family together for that kind of fun! In addition to these sweeping generalizations, you can also use them to find the businesses owned by your ancestors. As you can guess, there are a number of businesses owned by persons with Bohemian (or Czechoslovakian) names near Randolph and Second Streets. So, even if your family did not own a business, this could be a clue that you should be looking in the general vicinity for your family, if they are of Bohemian descent. Another hidden gem in a Sanborn are the names and widths of streets. For any researcher who has had to rely on census records or city directories to try and figure out where a relative lived, especially if street have been renamed or moved since then, this information is no small treat! Before now, these maps were only available by traveling great distances to larger libraries, or by paying for very pricy access online through private companies. 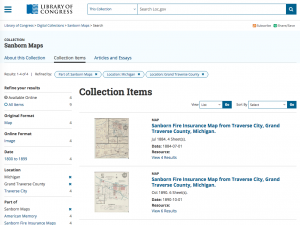 Every day, your library (whether here in Traverse City or the Library of Congress), is hard at work getting the information you need, in a way that you prefer. We live in amazing times! Does anyone else remember the Michigan Bell Strike of 1964? James (“Timber”) Gillette, George (“Pete”) Keller, Charles (“Chick”) Rennie and his wife, Margaret walked briskly towards the airplane that would take them to Milwaukee. It would be a good day to fly: the day was partly cloudy, not too warm, a welcome change from the blistering 96-degree weather that assaulted them only two days before. That heat wave had broken records all over the Midwest, but now, all that remained to remind locals of its unpleasantness was a touch of humidity. A high in the seventies was expected, perhaps a little cooler near the water. The pilot of the aircraft, Timber, was also its owner. He had purchased it a year previous and had flown it as a charter for many customers—Chick, chief among them. Having five years experience as a pilot, Timber felt confident he could take anyone anywhere they wanted to go—provided flying conditions were right. Aviators had a certain mystique that charmed the nation in the late twenties and early thirties. Charles Lindberg had crossed the Atlantic solo only six years before, and the exploits of pilot Wiley Post were regularly printed in newspapers across the land. The previous year, Amelia Earhart had flown across the Atlantic solo, duplicating Lindberg’s achievement. Flight was for the young and the adventuresome—and that described Timber. Image from the “Manitowoc Herald-Times,” June 1933. 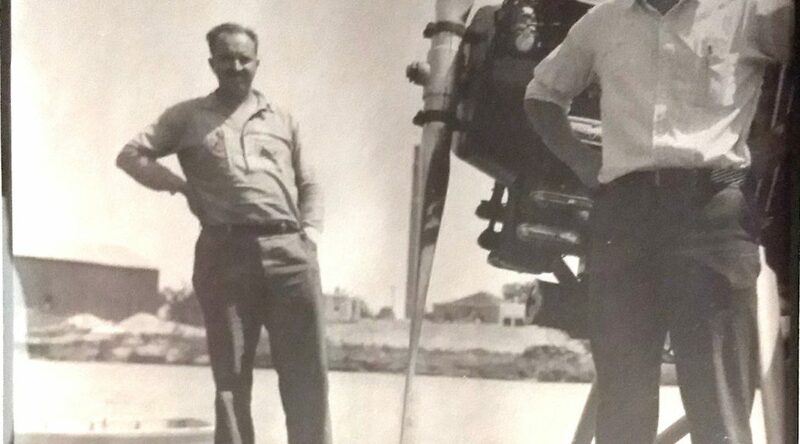 Pete was a mechanic hired by Timber, entrusted with keeping the airplane in top flying shape. To this end, he had undergone training in the maintenance of the aircraft in Detroit, Michigan. He knew autos, too, having operated a service station in his hometown of Frankfort, Michigan, for several years. Married with two young children, he was in transition, moving from Frankfort to Traverse City, now living in what was called a “house car” at the time at East Bay State Park (known in recent times as the Traverse City State Park). 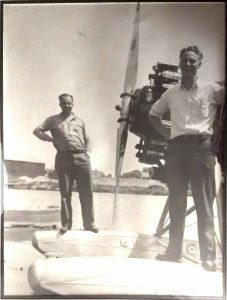 “Pete” (Ferris) Rennie, standing in the foreground, on the pontoons of an aircraft. His brother “Chick” (Charles) is in the background. This was not the aircraft that was in the accident, according to daughter Halcyon. Chick was Timber’s nephew, though the two hardly differed in age. Like Timber, he loved to fly: frequently he and Timber would travel to relatively nearby cities to conduct business for the Rennie Oil Company, the business started by his father, Charles Rennie, in 1923. Chick was only 28 years old, yet was already a vice president, carrying out company business as a seasoned veteran would. Today’s trip was to secure permission for a fuel unloading dock to be built at Greilickville, the settlement just north of the city limits in Leelanau County. The trip should not take long: Lake Michigan was only seventy miles wide, so the total time of transit could not take much more than a couple of hours. Margaret Rennie, about 29 years old. Image courtesy of her daughter, Halcyon. Margaret Rennie was not a frequent flyer—in fact, years later, her daughter Halcyon said that this might have been her first flight. She decided to come along as a passenger, taking the place of the loading dock’s contractor, Ben Samuelson. Margaret and Chick went to the same school, Central High School in Traverse City, Chick graduating in 1923 when Margaret was a junior. While the school yearbook tells us little about Chick, it tells more about Margaret. She was lead actor in a popular school play at the time, Daddy Long Legs, and appeared in other productions at the school. As a junior, she was nominated as “most beautiful,” though she apparently did not win the title. A flamboyant description under portrait in her senior year declaimed, “Thy beauty is like the pearls of the ocean.” Indeed, with her smile and her light brown hair, she does stand out among her classmates. Chick and Margaret married right after high school at ages 20 and 19 respectively. They had three young children already, John, Halcyon, and Martha Jean, ages eight, five, and three. In 1930 they lived in a pleasant house along East Bay. With Chick as an executive in a growing company, the family was moderately wealthy—a live-in maid served their needs. The plane they approached on this day was a Stinson Junior model aircraft fitted with pontoons for landing on water. It was a four-seat model, with a large overhead wing supported by struts on either side. The cabin was completely enclosed, a fairly recent innovation in aircraft design. Timber had purchased it a year before, happy to pilot the most advanced machine he could get. Its top speed was 125 mph, fast enough to make the trip to Milwaukee in an hour-and-half or less if the weather cooperated. The plane took off into the morning haze after nine o’clock. In twenty minutes it was approaching the Lake Michigan coast at Frankfort. Pete made sure they flew over the house of his family. They knew it would be him: it was always a joy for them to see his airplane pass overhead. Below, the foghorns were preparing to sound. Fog was coming in from the cold waters of the Lake. Image of the Rennie plane published in the Benzie Banner. The fog was as dense as iron. Timber looked at his passengers, and said they should land on the lake and taxi back to Frankfort until the fog lifted. He turned to begin the descent–too rapidly it seemed. With no visual cues to go by, it was impossible to level the flight path: Were they flying parallel to the water they would land on, or at an angle to it? At the same time, the altimeter could hardly keep up with their descent, the gauge moving faster than Timber had ever seen it. Fear stole over the cabin of the plane. The plane hit hard on the water, the impact turning the pontoons backward. 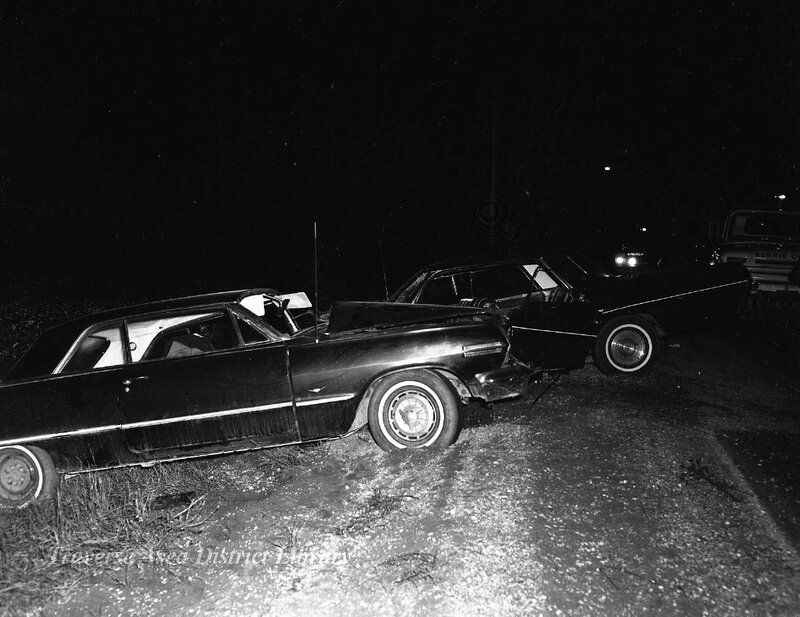 All four passengers were bruised, but not enough to keep them from devising a survival plan. Preparing to enter the water, they stripped off their heavier clothes and made signaling flags to attach to the plane, but, as water began to fill the cabin, it look as if the airplane would not stay afloat for long. They moved to the wings, and could look out towards Frankfort, a speck in the sunlight. The fog had lifted. The three men began to make a raft out of a gas tank attached to the wing, a metal vessel that measured about four feet on a side and four inches thick. Lashing two air cushions from the cabin to it, they made a float able to support one person, Margaret. As she told the story, “I got on the raft and the boys held onto the edge, swimming and trying to propel it toward shore. They talked back and forth, urging each other to stick to it and “Timber” said to me, “I got you in this and I’ll get you out.” She was told to lie on the raft to avoid exposure to the chilling water; the others would have to stay immersed since float did not have enough buoyancy for them all. At 3:30, five hours after they had flown over Frankfort, the plane sank. They were alone, the four of them, fifteen miles from shore, with the shadows of afternoon beginning to lengthen. The temperature was in the seventies—at most—but the water was much colder. Typically, in June it might be as warm as the mid- to upper fifties, and there is no reason to think it would have been warmer. That year Grand Traverse Bay had frozen later than it ever had—in late March—but it had frozen as it almost always did in that era. The human body cannot endure cold water for long. Survival time in 50-degree water is only one to two hours for a person treading water or holding onto a float. The symptoms are always the same; you become confused, irrational. Slowly you sink into semi-consciousness, then losing consciousness entirely. Various factors shape how long you will survive: body fat, clothing, how much effort you expended over time, and that indefinable quality, the will to live. The cold could not be bargained with. At five o’clock Pete started babbling incoherently. The others tried to rally him, but to no avail. He had to let go, disappearing under the waves. Timber was next, rambling on and on the way Pete had before. Chick and Margaret tried to hold him up onto the raft, but could not maintain a grip. He, too, slipped beneath the water. 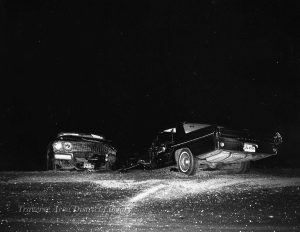 That version, with Pete Keller preceding James Gillette in death, was the version given to local news media, the Traverse City Record Eagle, the Benzie county newspaper, the Benzie Banner, and the Detroit Free Press. An account given to the Steven’s Point Daily Journal (Steven’s Point, Wisconsin) has James Gillette dying first. This story could have been obtained when Margaret Rennie was first being debriefed on the Wisconsin side of the Lake, where, because of her ordeal, she was likely to be confused. Chick boarded the raft and stayed with Margaret all night long as they talked and prayed together. All that time she had to cover a vent on the gas tank to keep more water from entering, her hand aching from the effort. Ships passed in the night, but too far away to hear their calls, too far away to see them. Light was just beginning to illuminate the eastern sky when the cold got to Chick. He began to lose consciousness just as the others had. In a moment of awareness before the end, he gave her papers, and money, detached a gold watch–an heirloom from his family–from its chain, and handed it to his wife. She clutched onto it tightly so that it could not fall into the water and begged him, “Please don’t go, Chick,” but could not hold on to him as he slipped off the raft. It overturned as he went under, but Margaret was somehow able to get back on. She kept her hand over the vent, not allowing water to enter. Feeling herself drifting into unconsciousness, she jerked herself back to reality, focusing on the sacrifice the three men had made for her as well as on her three children at home who would become orphans upon her death. The hours of the morning passed–and those of the early afternoon, as she grew weaker and less responsive. The sun disappeared in the late afternoon and the darkened sky spoke of another night on the raft. She knew she could not endure that. Ann Arbor Car Ferry Number 7 was barely an hour out of Frankfort, having left in the late afternoon in hazy sunlight, her twin stacks belching black smoke as she hurried along, an awesome sight to persons on small boats near the harbor—or, for that matter, to anyone floating on a flimsy raft in the water. 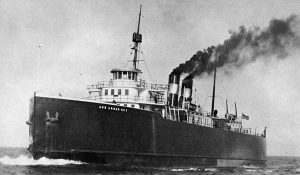 Three hundred thirty-seven feet long, a beam of 56 feet, and a draft of 19 feet, she was well suited for her job of carrying up to 30 railroad cars from one side of Lake Michigan to the other. Now she was on her way to Kenosha, Wisconsin. Two points off the starboard bow, nearly dead ahead, Quartermaster Arthur Johnson, at his position at the wheel, noticed a mysterious floating object and asked the Third Officer, Peter Strom, to have a look through the ship’s glasses. After a quick glance, he ordered the boat to slow and change course to intercept the object, which by this time—it was clear—was the raft with Margaret crying out for help in the most robust voice she could muster. Captain Alex Larson, on the main deck, had heard her faint cries, and had a lifeboat sent down to effect the rescue. With a few pulls on the oars, they approached the makeshift raft made up of a fuel tank lashed to two seat cushions. Margaret lay on them weakly, barely able to help her rescuers, too exhausted to move. She was gently lifted aboard the lifeboat which was then raised to the cabin deck. Helping hands guided her to a warm berth in one of the cabins; the rescue took all of twenty minutes. Mrs. Rennie said all of the men were cheerful and reminded her that they were only 15 miles from shore and that they would surely be picked up soon. “They did not complain,” she related, “although the water was bitterly cold. At this point of the story Mrs. Rennie broke down and sobbed hysterically. Calmed by Captain Larson, she continued. Then Mrs. Rennie’s voice choked again and she was unable to continue for several minutes. “Keller was the next to go.” She said. “The water was terribly cold and the air was chilly. Like Gillette, he couldn’t hold on any longer and my husband and I had to watch him as a grip his grip slipped off the raft. It was terrible. “Chick (her husband) and I held on through the awful night. It was so dark and cold and once in a while a stir of wind would lap a small wave over us and it would seem that the next minute would be our last. “It seemed the night would never pass, but we held on. Life seemed so dear. The sun came up and there we were, exhausted and hopeless of being saved. “Chick encouraged me and I encouraged him. We thought surely help would arrive. The day passed slowly and the sun was blisteringly hot. Chick began weakening like the rest and I was desperate, knowing what had happened to the others. “I guess I’m through. I can’t stand it any longer.” I pleaded with him to hold on, but even though he wanted to, he couldn’t. He fumbled around in his wet clothes and handed me his watch, papers, and money. The story of the drowning of her husband was too much for Mrs. Rennie and she broke down again. Plane crash, stop. Pete and Jim drowned Thursday night, stop. Chick drowned Friday morning, stop. I was picked up Friday night, be sure to tell mother I am all right. The stark facts given in the transmission pierced the hearts of all who read them. Car Ferry No. 7 returned immediately to Frankfort, arriving at 5:50 in the morning. Met there by friends and family, she returned to Traverse City to stay at the home of Chick’s parents. The news of the disaster broke on Friday evening, June 24, at 8:45 with radio transmissions from Margaret and Captain Larsen aboard the car ferry. The captain reported that three lives had been lost, and that the plane had gone down at 10:45 on Thursday, the 22nd. Before those broadcasts, no one in the Traverse area knew about the tragedy, everyone guessing the flight had arrived safely in Milwaukee. Word spread rapidly among friends and relatives by phone and word-of-mouth as many decided to drive to Frankfort to meet Margaret. The accident had a dramatic effect on the Traverse community. The Rennies were a well-known family, a pioneer family, and a family of some wealth and with prospects for much more, given the vigor of the oil industry at that time. Rennie Oil Company became a major distributor of petroleum products since its founding in 1923, reaching its peak in the 50’s and 60’s. 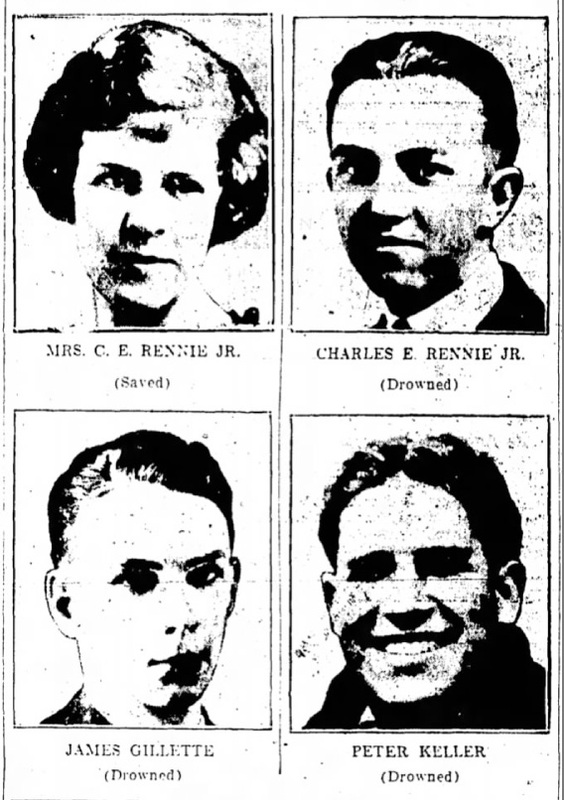 Charles Rennie, the father of “Chick” who died in the crash, was founder and president until his son Ferris (called “Pete”) took over in later years. Like his brother Chick, Pete was to perish in an accident, drowning as his propeller-driven sled plunged under icy Grand Traverse Bay in 1965. It was not just the prominence of the family that captured people’s attention at the time. The ordeal—the crash, the attempts at survival, the sacrifice of the men—made the story come alive, not just locally, but in newspapers all over the United States. The Traverse City Record Eagle announced the event with bold headlines, four columns on page one, four more on page two, with pictures of all four young people, Margaret in double size. Picked up by the Associated Press and United Press International, the story was carried nationally in all the big city newspapers from coast to coast. In particular, the Detroit Free Press offered an especially detailed account of the event. Honoring the dead did not wait for a formal funeral. While the tragedy was being played out, the Michigan Press Association was conducting a convention in Frankfort. Moved by what had happened, on Saturday, the day after Margaret was picked up, its members boarded a vessel to pay their respects. Stopping at the approximate location where the plane had gone down, they dipped the ship’s flag, sounded bugles, and laid flowers on the waves. The Reverend H. M. Smart offered solemn prayers for those who had perished as 300 stood at attention. A formal memorial was held for the three victims on July 17th at the First Congregational Church. Dr. Demas Cochlin delivered the eulogy: “They met their deaths bravely and well as heroes through the ages have met death. They were young men who had established themselves successfully in their home communities through diligence and ability and their untimely deaths were community losses.” Besides family and friends, all employees of the Rennie Oil Company attended the service. Margaret, having recovered from the ordeal, was also in attendance. Scant details about George (Pete) Keller were printed in the Record Eagle edition on the Saturday the story broke. Until a month before the accident, he operated a gas station in Frankfort. Only recently had he become a mechanic and assistant for James Gillette. At the time of the accident he was living in a “house car” in East Bay State Park (currently known as Traverse City State Park). He had two children at the time of his death. Pete is neglected in accounts of the crash, perhaps because of his lower socioeconomic status in the community. But, within the events that transpired on that awful day, his role could have been pivotal. As a trained mechanic, he was able to imagine separating the fuel tank from the aircraft to make a raft—and able to make it happen on an airplane rapidly filling with water. Certainly his skills—and confidence in his own ability—would have inspired hope that an improvised raft might save them all. The bodies of Charles “Chick” Rennie, James “Timber” Gillette, and George Keller were never found. That summer, a tweed jacket was uncovered on the beach near Glen Arbor, an article of clothing exactly like that Timber was wearing at the time of the accident. Two months later, other articles of clothing washed up on South Manitou Island, those also presumably belonging to the young men who had stripped off their heavier clothing after the plane impacted the water. The Rennie accident inspired many questions, both among those responsible for safe air travel and the public generally. Some centered on personal blame: Did the pilot err in leaving Traverse City in the first place? Did he make the right decision in turning back after 15 miles over Lake Michigan? Was he experienced in dealing with situations like that encountered beyond Frankfort? Pilot error is almost always involved in airplane accidents. Other questions probed the airplane, itself. One news account claimed it lacked a radio, an instrument that could have alerted authorities on shore that the pilot would attempt a forced landing on the Lake. A search for the airplane could have begun sooner with that information. Another question related to the safety equipment on board: Could the pilot and passengers have been saved if the plane was equipped with proper flotation devices? Inflatable rafts had been invented before 1933; in fact, one had saved Richard E. Byrd, an aviator who attempted a trans-Atlantic flight in 1925. After his plane had run out of fuel a mile off the French coast, he paddled to shore in one kept for just such an emergency. Finally, there were questions that we can ask now in light of our present knowledge about flying. How detailed and reliable were weather reports available to aviators at the time? Would James Gillette have set out that Thursday if he knew banks of fog lay off Frankfort? Communication between airports was quite primitive at the time, sometimes relying on telephone. Did the Milwaukee airport realize the plane failed to arrive on time, and, if so, why didn’t it set up an alarm? The wife of James Gillette phoned Milwaukee and was told erroneously that Rennie had already conducted his business. Only later on Friday after she telephoned the airport, did she learn they had never arrived, but by then it was too late: Within a few hours upon learning this news, she was told about the crash and the death of her husband. Surely, all of these questions must have entered the mind of Albert Meyers, inspector for the Department of Commerce, the agency for aviation safety at the time. He attempted to interview Margaret Rennie soon after the accident, but found she was too distraught at that time, and presumably had to return later. We know he wondered why, when the plane left Traverse City at 9:10, it plunged into Lake Michigan more than an hour-and-a-half later, the time elapsed longer than it would have taken to complete the journey. A possible answer to that question was printed in the Traverse City Record-Eagle, the Monday following the rescue. Chick Rennie’s friend, Jack G. Fleckenstein, reported that he had received a telegraph from Rennie dated Thursday, June 22nd at 9:50 that he was planning a trip to Canada in coming days. The stamped time on the telegram confirmed that the plane had not departed at 9:10 as erroneously indicated. Fleckenstein went on to confirm his friend’s experience and skill as a pilot: he often refused to fly if the weather looked doubtful. Unfortunately, the National Archives in Washington, D.C. has been unable to locate Meyer’s report—if it exists at all. Perhaps, the findings were wrapped into general summaries of airplane accidents at the time. Without it, researchers must deal only with newspapers and statements on the public record, a means of getting at the truth that leaves us with speculations, not conclusions. Newspaper weather forecasts for June 22, 1933 indicate a day expected to be mostly fair, temperature in the 70’s with scattered clouds. At a time before weather satellites and weather radar, that sort of forecast was the best that could be offered. There were no storms in the vicinity, no expectation of fog banks obscuring visibility. James Gillette was probably not at fault for attempting the journey on that day—at least as far as the weather was concerned. Jack Fleckenstein speculated that Rennie had flown directly to the Lake Michigan coast from Traverse City, then went due south to Frankfort to begin the cross-lake segment of the trip. Ordinarily, Chick would fly at 1200 feet, an altitude insufficient to climb above the fog bank. Fleckenstein noted that his friend distrusted altimeters, assuming they were off by as much as 400 feet. That distrust of his instruments could have been a factor in the crash. It is incredibly difficult to fly in clouds or fog, relying solely on instruments. Pilots must learn to ignore signals from their own balance system and constantly check the altimeter, airspeed indicator, magnetic compass, and any other instruments available to them (quite possibly the Stimson Junior had nothing else). To achieve instrument rating today requires many hours of training and experience: a pilot attempting to fly into clouds and fog without that experience survives by luck. However skillful James Gillette may have been, he was not prepared to encounter dense fog over Lake Michigan. Today, pilots training under Visual Flight Rules are instructed in the bare rudiments of instrument flying. For example, they are taught how to execute a 180 degree turn to fly out of a cloud, something that Gillette may have attempted as he descended to land on the water. We do not know if he received this kind of instruction when he was trained in the late 1920’s. In 1933 airport radar had not appeared in the form it has taken today. Airport workers did not have screens showing the movement of aircraft miles away: there were no blips that suddenly disappeared as in the case of an accident. At the same time, there was no weather radar to describe atmospheric conditions. A fogbank over Lake Michigan would have been reported to meteorologists elsewhere by telegraph, if at all. Given the technology of the time, James Gilette made do with the best forecast he could get upon his departure. His judgment was not faulty in this regard. The deaths of three persons in the Rennie crash could be attributed to many factors. Pilot error was a part of it: James Gillette failed to respond in a manner that could have saved his aircraft and the lives of his passengers. At the same time, the airplane itself had its shortcomings including the absence of an inflatable raft and communication devices (if, indeed, it had no radio). Weather forecasters had not yet come up with reliable descriptions of local weather conditions, including that off-shore fog building over a frigid lake. Finally, rescue efforts were not begun in time to save lives due to poor communication between airports and other individuals on the ground. The technology and protocols had not developed by 1933. In the twenties and thirties, aviation stirred the public as rockets did in the sixties and seventies. Aviators were the astronauts of their time, risking their lives to accomplish unbelievable things. While an ocean liner crossing the Atlantic would take four days at best, Charles Lindberg could accomplish the feat in 30 hours. Trains required three days to cross the continent in 1933. Roscoe Turner flew that distance in eleven-and-a-half hours. In the Traverse City area, Cherry Festival queens had arrived by airplane with much fanfare—in fact, James Gillette had piloted them to the city twice before. He was scheduled to perform the same duty for the festival the year he died. Airshows had become an exciting Festival event, much as the Blue Angels flight demonstration squadron today excites visitors in Cherry Festival performances before audiences numbering in the hundreds of thousands. For all the hoopla, flying was a dangerous business. Every six months the Commerce Department published the Air Commerce Bulletin, a report that summarized data concerning air safety. 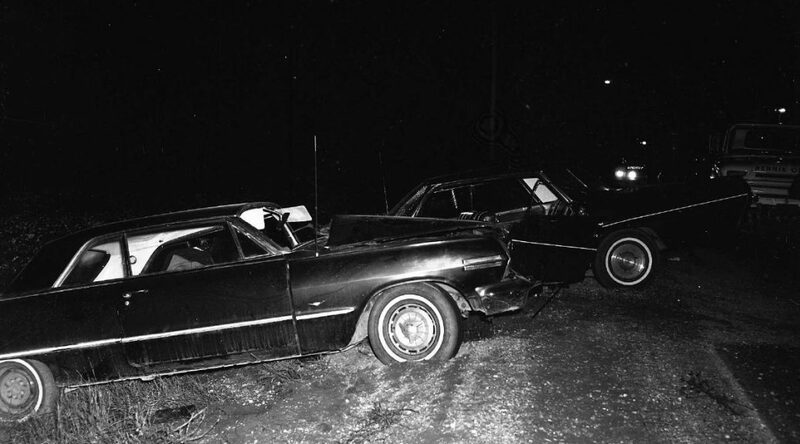 In the period that included the Rennie tragedy, 128 persons died in crashes, with more than 90 severely injured. One accident occurred for every 42 thousand miles traveled with one fatality for every 409 thousand miles. Seeing enormous opportunity for economic growth in the fledgling airline business, the government had an interest in improving safety. Passengers would not fly unless they were convinced they would arrive safely at their destinations. The Commerce Department analyzed the causes of airplane accidents in the Bulletin. Pilot error (called Personnel) was blamed for the greatest share of accidents–as it is today—accounting for 51 percent of all accidents. It was broken down into several categories including judgment, technique, and negligence. Would James Gillette have been faulted for going out when he should have (judgment)? It seems unlikely. Would he have been accused of not operating the airplane skillfully (technique)? Perhaps. He failed to execute a 180-degree turn to get out of the fog, and then to descend to the Lake. We do not know how the government inspector decided as to the cause of the Rennie accident. No doubt his subjective opinion determined what he wrote in his evaluation. Beyond pilot error, three other causes of accidents were highlighted in the Commerce Department report: engine failures, airplane failures, and a general category that captured such things as bad weather, darkness, and airport terrain. Fully twenty percent of accidents were caused by engines that stopped working in flight. Ten percent of them happened when the aircraft presumably lost an important component, a rudder, a section of wing, etc. The third category, natural causes outside the airplane, was responsible for 18 percent of crashes. Could the 1933 accident be blamed on the weather? Perhaps. It is a judgment call. Aircraft safety measures have made accidents like the Rennie tragedy exceedingly rare, even as flight hours have increased many times over. General aviation data from 1938 shows that the accident rate was 125.9 accidents per 100,000 flight hours. In 2009 the figure was 7.2. Nowadays, airplane engines rarely stop running in flight, essential parts do not fall off, weather reports are accurate so that pilots can make sound judgments about when to fly. If a plane does go down, a variety of mechanisms come into play: radio communication with flight control personnel and radar pinpoint the location. Today, a small aircraft regularly flying over Lake Michigan would have an inflatable raft able to hold five persons, an accessory desperately needed in the Rennie crash. Search-and-rescue teams aboard helicopters spring into action upon hearing a distress call. Since the thirties, it is no wonder that fatalities per 100,000 flight hours have decreased more rapidly than the accident rate for small aircraft. Three persons lost their lives, one survived on June 22, 1933 as a small plane plunged into Lake Michigan. The story of the heroic efforts of three men to save Margaret Rennie moved people in the Traverse area, the states of Michigan and Wisconsin, as well as the entire nation. Those efforts were seen as acts of chivalry in the Aviation Age, not different from those a hundred years previous in the Age of Sailing Ships—or even, for that matter, those of the Medieval Age before that. Beyond that symbolism, the Rennie accident did accomplish a more practical goal: through examining the causes and acting upon that information, it set the stage for protecting lives in the future from airplane crashes that could be prevented—or, if they did happen–made less tragic. That legacy lives with us today. Margaret Rennie remarried two years after the crash. She lived a relatively quiet life, bringing up her three children, John, Halcyon, and Martha Jean, in the Traverse area. According to a family member, she rarely discussed what happened to her: it was not something she wanted to relive. Throughout her life she kept rooms dark in the summer, drawing the blinds to keep the sun out. Was that because of the awful memories of sun and wind so long ago? Certainly the effects of that experience would color her days to the end of her life—and in ways she, herself, might be unaware of. Margaret died in 1972 at age 67. She was interred in the Omena Cemetery in Northern Michigan.